Popular, easy to grow and a naturally bushy shrub, Grevillea rosmarinifolia is named for the appearance of the foliage. Flowers are variable from pink to red with cream flushes. The plant itself will reach around 1 -2 metres in height depending on conditions. It is the spiky, rosemary like foliage that gives the plant its name. It is also one of the easiest to grow, this easy care plant has been grown in Europe since the 1800s. Long flowering with the main flush being from winter through to spring, this is a very useful garden and landscaping plant. Grevillea rosmarinifolia nana is a dwarf form that will reach around .5 metre in height. Such a great plant for hedges, attractive flowers and fine foliage make Grevillea rosmarinifolia and its cultivars a standout. And to add to the versatility, a dwarf variety is also available. Use this a low hedge, screening plant or as a feature in the garden border. Its naturally spiky foliage makes it a safe haven for birds, the flowers provide nectar as well as colour for the garden. This is a plant that has been used in gardens for many years, the spidery red flowers from winter to spring attract birds and bees to the garden as well as adding colour. 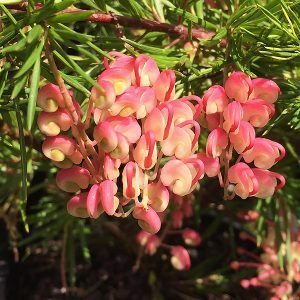 Growing well in temperate climates, given a well drained soil and sunny position, Grevillea rosmarinifolia is trouble free. A good layer of mulch will help to suppress weeds and maintain moist root run. Best planted in a well drained soil and in an open sunny position. Light pruning after flowering will keep the plant in a more compact growth habit. Fertiliser is not generally required, in poor soils, a little low phosphate native plant fertiliser can be beneficial. Scarlet spite – Small growing to around 1 metre with good red flowers. Pink Pixie – Smaller growing variety. Common Name – Rosemary Grevilea. Soil – Well drained. Height – From 2 metres to around .5 metres depending on variety. Flowers – Red and spider like. Foliage – Mid to deep green and rosemary like.